Every year Project Censored, the oldest news-monitoring group in the country, publishes a list of the top 25 most under-reported stories of the year, and this year “Fracking Our Food Supply” by Elizabeth Royte made the list. (BCAction posted it for you earlier this year.) Just reading a description of what hydraulic fracturing, or fracking, does to the earth turns my stomach: it’s an aggressive, mechanical, extractive process that involves the high-pressure injection of a mixture of water, sand, and toxic chemicals deep into drill holes in the earth. The blasts create tiny pathways for fluids such as gas and petroleum to find its way into the wells. The images of creeping carcinogens oozing into our food and watertable are enough to fuel nightmares. This nasty business has been going on fairly quietly for nearly 65 years, long enough to embed itself in our food chain, and long enough for my nightmares to become reality. Long enough that ranchers in Pennsylvania, Louisiana, Colorado, New Mexico, and North Dakota have started reporting health problems and incidents of both dead and poisoned livestock associated with increased levels of toxic chemicals in their well water. Long enough for people living in close proximity to fracking rigs to suffer the onset of otherwise unexplainable rashes, nosebleeds, breathing and intestinal problems. And long enough that two prominent insurance companies that serve the business of agriculture now refuse to cover damages from fracking. As is often the case with toxic chemical use in this country, there has been little to no long-term testing on an unregulated process, and once again, the general public serves as the guinea pig. There has been so much secrecy around the process that we just dig ourselves deeper and deeper into a black hole of ignorance around issues of food safety and the public health. As a passionate member of the anti-fracking movement, it can be exhausting to live with the sense of urgency and impending crisis when it comes to this horrifying practice. And with Big Gas & Oil (BG&O ) looming Goliath-like, it will take many thousands of us to generate and then maintain the momentum necessary to ban fracking. 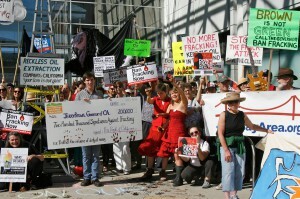 Hundreds of activists rallied against fracking in Oakland, CA during the Global Frackdown on Oct. 19th. On Saturday, October 19, Breast Cancer Action turned out to join the international community to march in the 2nd annual Global Frackdown. We joined thousands of activists around the world, from Romania to Indonesia, Spain to New Zealand and Africa, demanding an end to fracking and calling for clean, sustainable energy sources. It became so clear to me, along with my coworker Caitlin and our volunteers Vanessa and Qing, that BCAction’s voice is essential to this movement – BCAction is uniquely qualified to speak to the devastating effects of toxins and endocrine disruptors on women’s health, after 20+ years of advocating for attention to involuntary environmental exposures. The rally started in Frank Ogawa Plaza in Oakland, and we were joined by many of our allies from the social/environmental justice world. Infusions of inspiration were provided from representatives from the Asian Pacific Environmental Network, the California Coastal Commission, Global Exchange, the East Bay Municipal Utility District, 350 Bay Area, the Center for Biological Diversity, and chefs from Chez Panisse, leaders in the sustainable food movement. From there we marched to the State Building, made a call to Governor Brown, and demanded that he step up and start acting like the “environmental governor” he claims to be. Though revenue from fracking has the potential to generate billions of dollars, at the cost of public health and the environment, California will not be bought. Yes – it was a day of regeneration and hope. But rumbling in my heart was a lingering unrest. 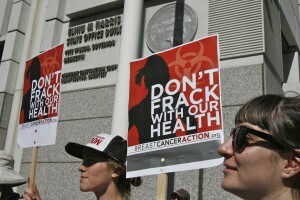 Why do we let procedures and practices like fracking go on for so long before we rise up? Why have we given BO&G such an incredibly long headstart, raking in billions of dollars and then moving on to leave the public to deal with long-term consequences to health and our lands? From 1990 – 2011, oil and gas companies contributed $238.7 million into gubernatorial and Congressional election campaigns to persuade lawmakers that fracking is safe. This money spent by the fracking industry specifically targeted to influence oversight committees: members of the House Energy and Commerce Committee and the Senate Committee on Environment and Public Works. The 2005 Bush-Cheney Energy Policy Act exempted fracking from the Safe Drinking Water Act, and contaminants have now been found in drinking water in Texas, Pennsylvania, Louisiana, Wyoming and Colorado. Once the chemicals make their way into our water supply, they leach into the soil, into agricultural land and livestock, and onto our dinner plates. There’s no fixing that. 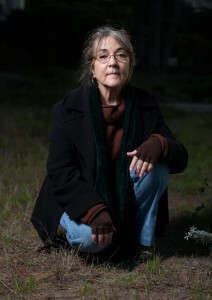 According to Project Censored investigators, the absence of whistleblowers is attributed to “fear of retaliation, nondisclosure agreements, or involvement in active litigation.” BO&G is filthy rich, for sure, and so powerful that, without relentless oversight, the very food supply we depend on and water that sustains us is in danger of being irreparably damaged. And I refuse to be forced to turn to Monsanto’s cockamamie chemistry to survive! For more than 20 years, BCAction has been connecting the dots between involuntary exposure to environmental toxins and breast cancer. We have been advocating for the Precautionary Principle, with a clear understanding that chemical policy reform is a major step toward stopping this disease before it starts. The lack of regulation and accountability in the fracking industry’s use of over 700 chemicals, including known carcinogens, is a glaring example of greed and profit taking precedent over people’s health. BCAction’s participation in the global anti-fracking movement brings a vital voice to the public debate. On Saturday I was so aware of a sea change. We are building a tsunami of voices persistent enough to overpower and end the roar of hydraulic fracturing once and for all, loud enough to beat back the American Chemical Council that spends millions to lobby against chemical policy reform. As a founding member of Americans Against Fracking, BCAction invites you to add your voice to the movement. We are determined to continue our work to ensure the public health and the protection of our planet. We desperately need your voice, before we’re too fracked to fix.